The Wonder Lake Master Property Owners Association is reminding boaters, anglers, and water skiers to remove, drain, and dry after a day on the water to prevent the spread of invasive species. 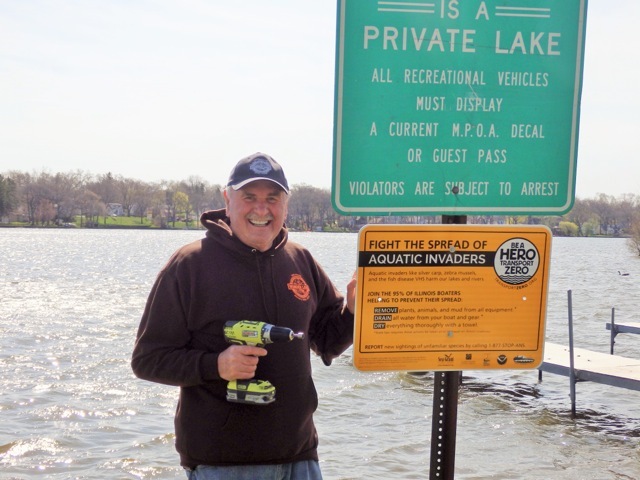 These Be a Hero—Transport Zero™ steps can now be found at 14 boat ramps around the Illinois private lake. The signs were installed during the annual spring cleanup, one of many events hosted by the Wonder Lake Sportsman’s Club. And it’s just the latest effort designed to raise awareness of aquatic invasive species and how they spread. The recent surge of outreach at Wonder Lake is largely driven by concern over invasive plants like Phragmites, a species that’s spreading quickly across the Great Lakes region. Plant life along the lakeshore is limited now, but an ongoing dredging project is expected to change that. Randy Stowe, the lake manager, wants to make sure that the species that move in don’t pose a threat to habitats and recreation. Learn more about how you can fight the spread of invasive species at TransportZero.org. Our team helped deploy the #Waukegan buoy in Lake Michigan! © 2019 Illinois-Indiana Sea Grant, All Rights Reserved. Illinois-Indiana Sea Grant strives to ensure equal access and an inclusive environment.